I graduated from the rented Sea Scouter little piglet to the wonderful, Phil Rhodes-designed, 12-foot Penguin dinghy that the junior yacht club owned. These were hard-chine boats with room for two and they sailed like a dream in light to moderate air. But they were not designed to plane, so off the wind on a breeze you would have to practically sit on the transom to keep the bow from submarining. Then along came the OK dinghy and the Laser and all we wanted to do was plane across the lake at blistering speeds. But this took some skill and a bathing suit. The docile family daysailers slowly faded away while the planing classes took over. Before long it was evident that there was a need for a less physically demanding daysailer. This trend gave rise to a number of new daysailers and one of particular interest to me is this Scandinavian Cruiser being built in China by a group headed by Nis Peter Lorentzen. The idea behind this beautiful little boat is a return to the proportions of the Scandinavian Skerry cruisers, like the 30 square meter class. These boats had long overhangs, narrow hulls and tall, high-aspect-ratio rigs. If you know the Dragon class you know the type I am talking about. Nis wanted a daysailer with that look and, as he had been working on a 40-foot Skerry cruiser type with Eric Sponberg, Nis based the new 20-footer on that design work. But technically we would call this an "in-house" design. The hull is narrow with an L/B of 4.53. There is 6 feet, 8 inches of total overhang for a DWL of 12 feet, 7 inches and a D/L of 183, so this is a moderate displacement narrow boat. I added 200 pounds to the listed displacement to account for the crew weight. The carbon fiber lifting keel draws 4 feet, 7 inches. The carbon rudder is also retractable for easy trailering. I'm sure this boat is a joy to sail upwind. Narrow boats can be very light on the helm. You sit on the rail to hike but some photos and drawings of the SC 20 show a man on a trapeze for additional stability. The downside of this design approach is that this is not a hull designed to plane. If I were going to go to the trouble of rigging up a trapeze I think I'd like to enjoy some planing speeds off the wind. But that's another boat. 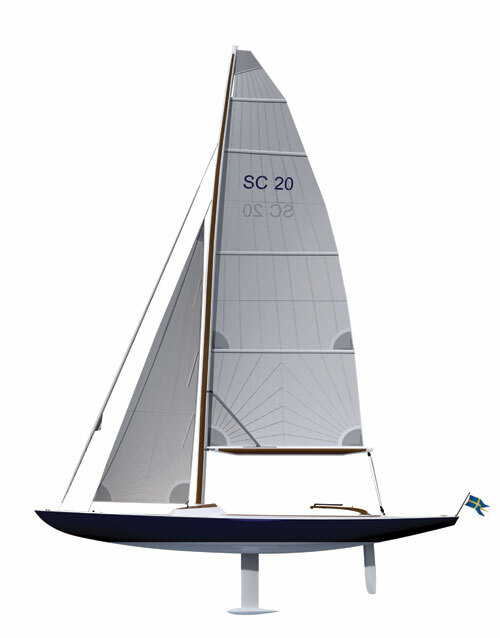 The SC 20 is designed for a different style of sailing. The rig features what the promo material calls a "rotating, semi-unstayed tapered carbon wingmast." I think "semi-unstayed" means there are no shrouds and no backstay. There is a headstay for the jib and a Code Zero or gennaker can be flown from a tack point forward of the jib tack point. The jib is self-tacking but the sheeting angle to the track is only 8 degrees and I think this is not enough, especially in a breeze. All sail control lines lead to clusters of cam cleats port and starboard in the cockpit where they are right at the hands of the skipper. The mainsheet traveler is aft of the cockpit with end-boom sheeting. No winches are required but I'd guess that Code Zero sheet could see some good loads. Again, adding 200 pounds to the listed displacement I get an SA/D of 25.26. The cockpit is long but it's too narrow for seats so you sit on the side decks all the time. I think any more than two adults would be too much for this cockpit. The deck edge is nicely rolled for hiking comfort. There is a tiny cuddy cabin but I'm not sure what you would put in there besides your lunch. This design is all about making a pretty, vintage picture on the water. Along with that you get a type of performance not usually found on today's high-performance dinghies. I can easily see myself enjoying this boat. I could spend a lot of time in this boat. I'm willing to hike but I'm not sure if I would use the trapeze unless I was in an unusually good mood. There is no small daysailer quite like this one and that's one reason I like it. We'll just have to wait and see how many others like it. LOA 19'3"; LWL 12'7"; Beam 4'3"; Draft 4'7" (keel down), 1'2" (keel up); Displacement 617 lbs. ; Ballast 309 lbs. ; Sail area 138 sq. ft.; SA/D 30.47; D/L 138; L/B 4.53. Scandinavian Cruisers USA, 1501 Half Moon Bay Dr., Croton-on-Hudson, NY 10520, (203) 522-6727, www.scandinaviancruisers.com.